My presidential year has also provided me with the chance to advocate for ASCO’s principles to support our members and our patients. Here, I have chosen to comment on four topics that highlighted my tenure: precision medicine—a medical model near and dear to my heart; the state of cancer care in America, and the efforts ASCO and other organizations have made to eliminate barriers to the dissemination of precision medicine; the threats to our health care system; and ASCO’s strategic planning goals for the future. My tenure as ASCO President spans more than 3 years, first as President-Elect starting in June 2016, then as President from 2017 to 2018, and finally as Immediate Past President. During ASCO’s Board meeting in 2017, I had the privilege of participating in the interviewing process to hire a new Chief Executive Officer when Allen S. Lichter, MD, FASCO, announced he would be stepping down after 10 years in that position. 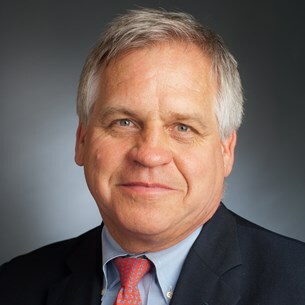 I could not be happier with our choice of naming Clifford A. Hudis, MD, FACP, FASCO, as ASCO’s CEO. Over the past 2 years, he has capably and admirably served our Society. One of my first steps after being elected President was to work with the ASCO staff to come up with a theme for my presidential year and for this year’s Annual Meeting. While running for President of ASCO, I stated that because we hold the reins of the Society for only 1 year, it is critically important to embrace the existing priorities of ASCO while coming up with a theme for the Annual Meeting. The panels brought together experts from diverse backgrounds, including oncology providers and representatives from diagnostic companies, the pharmaceutical industry, regulatory agencies, and third-party payers. Panel members described how the capability of deploying the advances of precision medicine to an increasing proportion of patients was an ongoing process. Chimeric antigen receptor (CAR) T-cell immunotherapy, which was named Advance of the Year in ASCO’s Clinical Cancer Advances 2018 report, was highlighted as an example. The event was well received by the more than 100 attendees, including members of the press, government agencies, professional societies, and patient advocacy groups. The year of my presidency was also characterized by potential upheavals in federal support of our health care system, with proposals from Congress to repeal and replace the Patient Protection and Affordable Care Act. Many of the changes proposed would have had a substantial impact on access to health care for many of our patients. Barriers to oncology care are many and include low-education level, poor health literacy, lack of health insurance or underinsurance, and poverty. Changes in governmental health care policies that impact accessibility to cancer care hurt vulnerable populations the most. All Americans should have access to affordable and sufficient health care coverage regardless of their income or health status. Any efforts to reform the health care system at the national, state, or local level should ensure that individuals with health care insurance can continue to access affordable insurance without interruption. All individuals with cancer should have health insurance that guarantees access to high-quality cancer care that is delivered by a cancer specialist and that provides the full range of services in a timely manner. In any policy changes, policymakers should promote and protect cancer prevention and screening services, as they are key to reducing cancer mortality. All patients should have meaningful access to clinical trials, and health insurance coverage should not be a barrier to clinical trials participation. Current efforts to improve the quality, affordability, and access to care for patients and communities through value-based reform strategies should be continued. Health care reform efforts should engage patients and providers to obtain meaningful input to avoid unintended consequences during implementation. The recommendations I want to call particular attention to are the first and fourth ones, because they are key to reducing cancer mortality. For example, prevention screenings for several cancers, including breast, cervical, prostate, and colorectal, have led to reductions in mortality rates for these diseases. And my field of thoracic oncology has benefited greatly from low-dose computed tomography screening in people with a smoking history, reducing lung cancer mortality by up to 20% and potentially saving about 15,000 lives each year in the United States. In addition, smoking cessation programs and prevention campaigns have led to declining smoking rates in this country—20.9% in 2005 to 15.5% in 20164—and falling death rates from lung cancer. However, there is more work to do. An estimated 38 million Americans still smoke, and the burden of cigarette smoking is particularly high in other parts of the world, especially in countries like China, where more than 300 million are smokers. Public health measures to reduce smoking rates and diminish the ongoing epidemic of lung cancer deaths in China and other countries around the world, including the United States, are urgently needed. We also need strategies to reduce the global burden of cancer. Cancer is the second leading cause of death globally and was responsible for 8.8 million deaths in 2015. As my Presidential year comes to a close, I’m happy to pass the reins to President-Elect Monica M. Bertagnolli, MD, FACS, FASCO, who will become ASCO’s 55th President during the 2018 ASCO Annual Meeting. Dr. Bertagnolli brings an abundant array of talent to lead our Society, and I look forward to supporting her efforts. Serving as ASCO President and helping to fulfill our core mission—“To conquer cancer through research, education, and the promotion of the highest-quality care”—have been both a privilege and an honor, and I am most grateful to have had this opportunity to serve our Society. Originally published in The ASCO Post; adapted and republished with permission.